In patients with muscle injury or muscle disease, assessment of muscle damage is typically limited to clinical signs, such as tenderness, strength, range of motion, and more recently, imaging studies. Biological markers can also be used in measuring muscle injury, such as increased creatine kinase levels in the blood, but these are not always correlated with loss in muscle function (i.e. loss of force production). This is even true of histological findings from animals, which provide a “direct measure” of damage, but do not account for loss of function. The most comprehensive measure of the overall health of the muscle is contractile force. To date, animal models testing contractile force have been limited to the muscle groups moving the ankle. 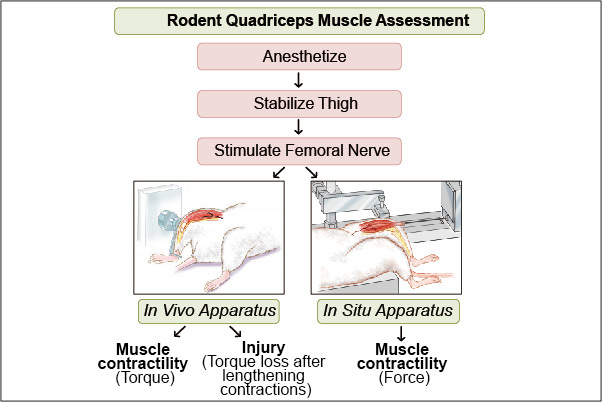 Here we describe an in vivo animal model for the quadriceps, with abilities to measure torque, produce a reliable muscle injury, and follow muscle recovery within the same animal over time. We also describe a second model used for direct measurement of force from an isolated quadriceps muscle in situ.